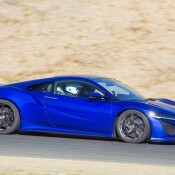 Since the day it was introduced as a concept, we’ve been bombarded every other week with material on how awesome the new Acura NSX is and how it will rewrite the rulebook on super car making when it’s released. But the car itself is still nowhere in sight. Well, until now. 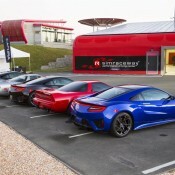 The new 2017 Acura NSX finally gearing up for launch, and although it is still a year and a bit away from actually hitting the streets, the company has confirmed its final technical details and also given us a bunch of new pictures to keep up amused until then. So, the 2017 Acura NSX: it has a “Sport Hybrid Power Unit” consisting of a bespoke, mid-mounted twin-turbocharged, 75-degree 3.5-liter DOHC V6 engine with dry sump lubrication, mated to an all-new 9-speed dual clutch transmission (9DCT) and Direct-Drive Motor. This results in what Acura calls “zero delay” response. So the moment you press the accelerator, you have the 500 hp and 550 Nm torque output of the engine at your disposal. Boasting an aluminum-intensive space frame and a carbon fiber body, Acura NSX manages to strike a balance between lightness (curb weight 3,803 lbs) and rigidity, both for the sake of handling and crash protection. 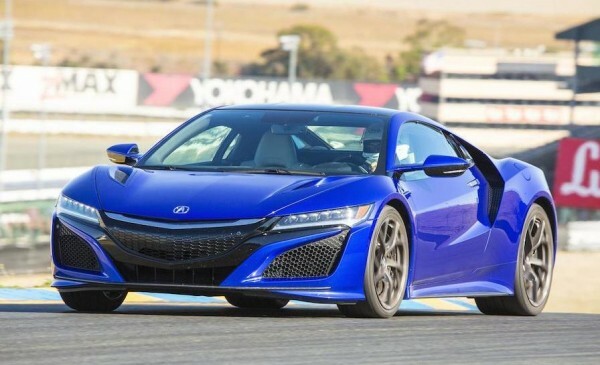 What’s more, it has a Sport Hybrid All-Wheel-Drive system and double wishbone suspension which deliver what Acura likes to refer to as on-rial cornering. The raises the question, will be able to slide this car if you want to? 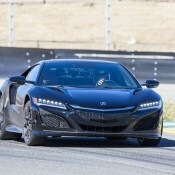 The post Yet Another Introduction to 2017 Acura NSX appeared first on Motorward.